(Nanowerk News) Optics & Photonics is known as the premier show in North America for the latest advancements in optical engineering and applications, nanotechnology, sustainable energy, organic photonics, and astronomical instrumentation. In San Diego next week, PI’s booth will feature the latest state-of-the-art precision motion technologies and interactive displays of nanopositioning components, with PI engineers on-hand to answer questions and help you find the right solution for your precision motion project in industry, research, or science. The need for miniaturization of instruments requires opto-mechanical alignment, positioning, and assembly on a smaller scale. Direct drive piezo inertia motors that are only a few millimeters in size enable ultra-compact nano-positioning stages, as small as a finger-tip. PI provides standard and custom designs for OEMs including linear, rotary, XY, XYZ and 6 degree of freedom systems. PI’s photonics alignment product line addresses the requirement of aligning multiple parallel optical paths with multiple, interacting inputs and outputs, all requiring optimization. The automated alignment engines include 3 to 6-axis mechanisms, controllers with firmware based alignment algorithms, and the software tools to meet the high accuracy demands of different markets, such as packing, planar testing, or inspection. Hexapod 6-axis parallel positioning systems are instrumental to fast SiP alignment due to their lower inertia, improved dynamics, smaller package size and higher stiffness, and programmable pivot point. PI develops complete engineered motion systems for precision automation applications including laser machining and flat panel inspection. Air bearings with linear motor drives provide vibration-free motion, highly constant velocity control, along with best in class accuracy and geometric performance. When short travel ranges are concerned, piezo flexure-guided linear positioners offer excellent precision and responsiveness with step and settle typically in the millisecond range and billions of cycles of service life. Researchers require the sub-atomic resolution and extreme responsiveness of piezo nanopositioners to create higher-quality images faster. PI provides a large variety of fast XY (Z) stages and piezo collar lens positioners for 3D imaging (Z-stack acquisition), deconvolution, and fast auto-focusing applications. 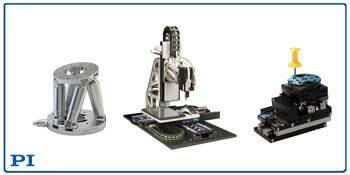 A line of ultra-stable long-travel microscope stages with self-locking piezo motors is also available. PI is a leading manufacturer of precision motion control equipment, piezo motors, air bearing stages and hexapod parallel-kinematics for semiconductor applications, photonics, bio-nano-technology and medical engineering. PI has been developing and manufacturing standard & custom precision products with piezoceramic and electromagnetic drives for 4 decades. The company has been ISO 9001 certified since 1994 and provides innovative, high-quality solutions for OEM and research. PI is present worldwide with fifteen subsidiaries, R&D / engineering on 3 continents and total staff of more than 1,000.